If ever you are trapped in a hotel or hospital room and feel too ill-disposed or lethargic to read or write or engage in profound conversation with visitors (if anyone is foolish enough to visit you), you may wish to tune into one of several channels available to TV viewers that dish up potted histories of the twentieth century and are aimed, no doubt, at pensioners, or those of us who are infirm or bedridden or terminally idle, and who grew up in the shadow, even the distant shadow, of World War Two. Given that the Brits in general are morbidly obsessed with their performance in said war (I don’t think the Russians, for example, are so confused about their actual contribution), and given that it was the last occasion in which the citizens of these islands ‘pulled together’ as my mother was fond of reminding us, I personally have no difficulty in enduring hour upon hour of such documentary, especially those that delve deeply within the dark underworld of the Nazi party and its extraordinarily mediocre and sinister leadership. Perhaps this paradox is what most intrigues us. 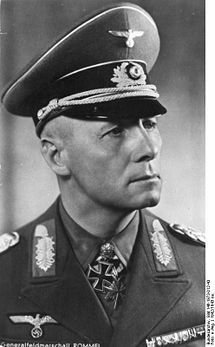 A favourite topic of these programmes seems to be ‘the plot to assassinate Hitler’, and the various theories about the involvement in such activities of the Desert Fox, General Erwin Rommel, who was ‘urged’ to commit suicide by Adolf Hitler, in order to avoid the negative publicity that would doubtless have redounded on the leadership if it were known that a war hero of Rommel’s stature were involved in the assassination attempt. The other day, watching a programme about German POWs in England at the end of the war, I was reminded of an anecdote of my father’s. He was, for a while, medical officer at the POW camp based in Dover Castle. One morning, during surgery, a German soldier asked, through the interpreter, whether my father thought the state of his uniform befitted an officer of His Britannic Majesty’s Forces. My father, for whom sartorial matters were never of paramount importance, was rather taken aback by the audacity of the question, and asked the soldier why he thought it appropriate to comment on his state of dress. The soldier replied that he was simply trying to be of service, that he had served as personal tailor to Field Marshal Rommel, and was willing to make the Herr Doktor the most presentable officer in the British army, for the price of only two packs of cigarettes. My father, who didn’t smoke, reckoned this was a good deal, and handed over his uniform to the man, who duly returned it, immaculately re-tailored. He was so pleased with the result that he remained, for the duration of his stay at Dover, in the care of Rommel’s tailor for all matters of couture. A great story, Richard. That’s the kind of thing that writers never consider for their own stories. It must be absolutely true. I’ve loved it. Funny thing is, it’s not a story my father repeated. I only heard it for the first time a couple of years ago, when he was already 86.